Often when people think of a stability ball, the thing that first comes to mind is some yogi doing an acrobatic or impossibly flexible pose. However, there’s a lot more to this unique piece of exercise equipment than just yoga. As a matter of fact, anyone – yogi, athlete or average Joe / Jane – can benefit from incorporating a stability ball into their life. Muscle groups such as your abs and the rest of your core can be engaged and worked very effectively with a stability ball. 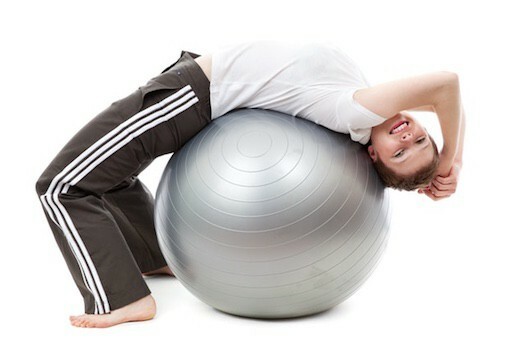 Research has consistently shown that training with a stability ball helps to develop stable and efficient core muslces. Regular use can also help alleviate issues such as muscle tightness and back pain. 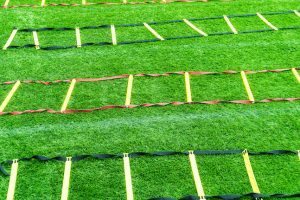 It’s also ideal for both beginner and advanced athletes looking to increase the complexity of their training routine. Everything from basic strength workouts to advanced flexibility routines are possible. Compared to the objects you’d traditionally sit on, stability balls are (ironically) quite unstable. This forces you to increase your muscle activation, subsequently improving your core strength and posture. As a result, they make surprisingly good substitutes for your standard office chair. In fact, research looking at the use of stability balls in the workplace found that people who used a ball as a substitute for their regular office chair felt they developed better posture and balance, and reported less pain from sitting. 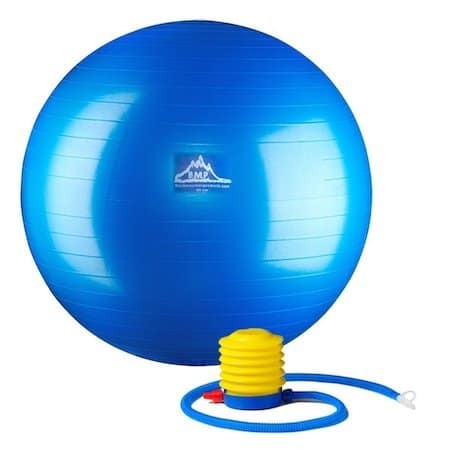 Research findings such those mentioned above have prompted people to successfully explore the use of stability balls in areas such as injury prevention and rehabilitation, pregnancy, child birth, and even classroom education. For those looking into buying their first stability ball, it’s worth noting that there’s a lot more to this deceptively simple piece of equipment than meets the eye. There are subtle variations in size, quality, and functionality that can make purchasing the best stability ball for you less straightforward than it may seem. In this article, we’ll examine and recommend the top stability balls that should meet the needs of pretty much everyone and suit pretty much any purpose. We’ve also included some information on choosing the right stability ball, and getting started with your ball later in this post, so be sure to stick around. Compared to other fitness equipment, even the most expensive stability balls provide a nearly incomparable amount of value. The plethora of exercises you can do with them, combined with their sheer versatility, makes them a great long term investment. Here are the best options currently available on the market. Don’t let the conservative design of ProSource’s Exercise Stability Ball fool you – it’s built to last and and offers exceptional value for an affordable stability ball. A burst rating of 2000 lb ensures that it can handle more weight than you can ever force onto it. A simple foot pump is included for easy inflation, along with an extra air plug for additional value. Size options include 55, 65 and 75 cms. Plus, as a reader of The Home Fit Freak, you can use our discount code FITFREAK15 to get 15% off everything at ProSource. 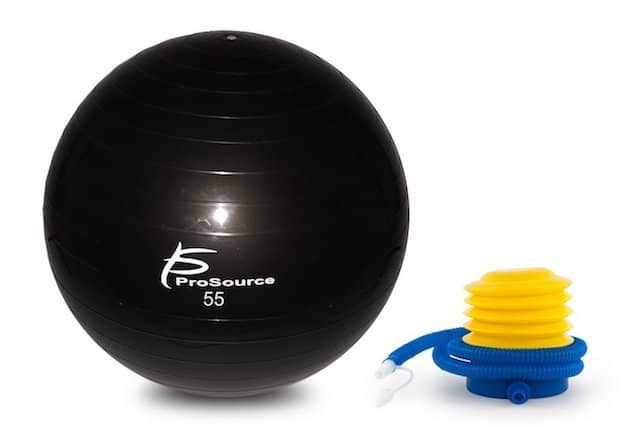 This ProSource stability ball is cheap, functional and wins on simple value alone. If you want to get the full package without breaking the bank, it doesn’t get much better than Epitome’s take on the stability ball. 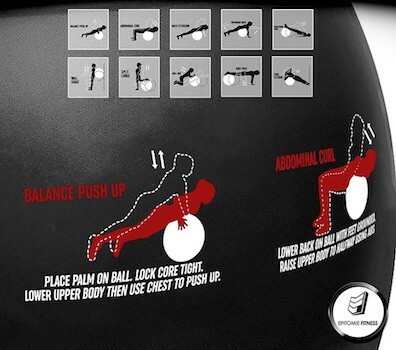 The first thing you’ll probably notice is the list of exercises printed on the ball itself. It’s an admirable and unique quirk that’ll save beginners some research time. Thanks to the included eBook, you can further save yourself from browsing around for exercises when getting started. Upon opening the high quality box, you’ll be greeted with a hand pump, air plug remover and not one, but two spare air plugs. Four color options and a standard range of sizes are offered. Perhaps most impressive is that Epitome is so confident in their ball’s 2000 lb burst rating that a lifetime guarantee is included with every purchase. Whether you need a recovery tool, a new piece of equipment for your workout gear arsenal, or a healthy office chair replacement, Black Mountain’s professional grade stability ball is a solid option. The high quality construction offers a burst rating of just under a ton. A smooth texture and complete absence of the factory vinyl smell found on cheaper balls further adds to the build quality. Upon first inflation, we found that the ball takes some time to stretch and expand before being able to reach its full size. This is a fairly common quirk that simply requires some patience to overcome. A comprehensive list of sizes ranging from 45 to 85 cms are available, along with color options to suit every taste. 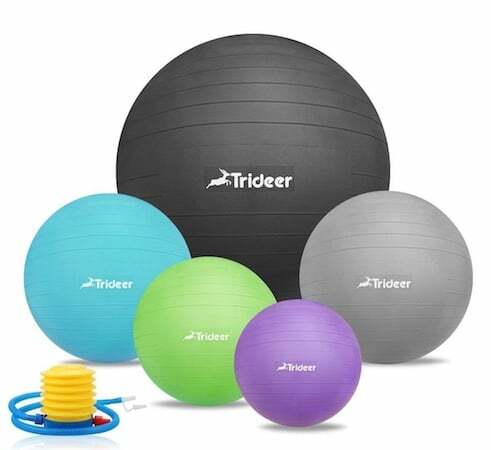 If other manufacturer’s utilitarian approach to stability ball design doesn’t tickle your fancy, Trideer’s extensive list of color and pattern options are sure to satisfy your demand for uniqueness. 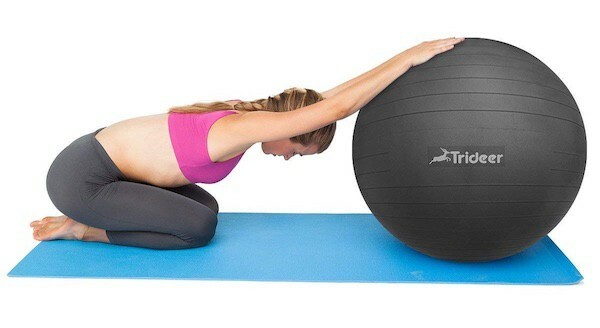 But don’t be fooled – the Trideer Stability Ball is more than just nice to look at. The 2000 micrometer thickness helps it achieve a burst rating of 2200 lb. An anti-slip texture covers the non-toxic, BPA and heavy metal-free material. Two spare air stoppers and a foot pump are included with every purchase. The list of size options is nearly as long as the designs, with diameters ranging from 45 cm all the way up to 85 cm. 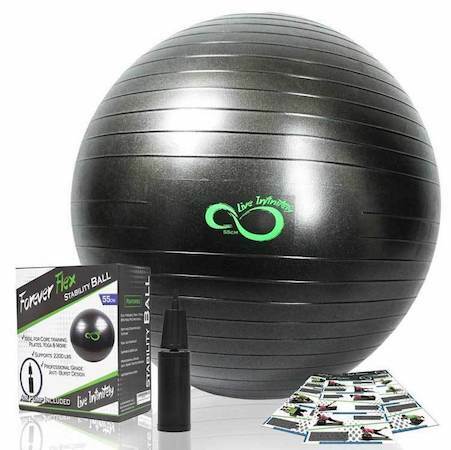 This is a very good-looking and functional stability ball at a great price point. 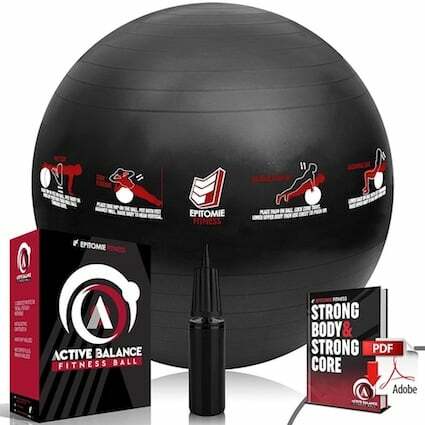 Whether you want to build core strength, hit some difficult yoga poses, or improve your sitting posture, this ball is definitely worth a look. While daily use of Live Infinitely’s stability ball offering doesn’t guarantee immortality, you’ll probably add a few years to your life thanks to the peace of mind that it’ll last for as long as you need it. A professional-grade, non-toxic PVC material makes up this 2200 lb burst-rated ball. In the box you’ll find a standard set of accessories, including a hand pump, air plug and air plug remover. You’ll also be granted access to Live Infinitely’s online training workouts and digital exercise guides. A one year, full coverage warranty comes standard. Sizes start at 55cm, going all the way up to a gigantic 95 cm option that’ll serve even the most demanding athlete. 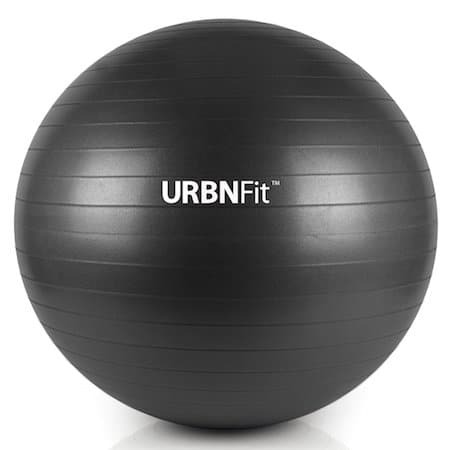 If you’re looking for a solid stability ball to get started with, or simply want to replace your current one with something that’ll last, URBNFit’s Exercise Ball is a considerable option. Along with a dual action hand pump and two air stoppers, you’ll also receive a handy exercise guide with some starter workouts and additional information. The 2000 lb burst-rated PVC material is non-toxic and free from synthetic odor. Eight color options and diameters ranging from 45 to 85 cms are offered. A manufacturer money-back guarantee, along with Amazon’s unrivaled customer support gives you all the peace of mind you need that you get what you’re paying for. The first detail to consider when buying a stability ball is size. The higher you reach, the bigger your ball needs to be. In this post, we’ve only included balls from manufacturers that provide enough sizes to fit athletes of all heights. Use the following guideline to determine the most suitable diameter for you. If you plan on using your stability ball as a chair, ensure that it’s large enough for you to sit at the ideal height for your desk. We’ve found diameters in the 75 cm range to be the most suitable option for office yogis. Modern stability balls are built to handle as much weight as you can apply. That said, heavier athletes such as bodybuilders will be more comfortable with larger diameters. Like any piece of fitness equipment, durability is essential. A cheap ball that explodes like a gigantic balloon is the last thing you want to be using in a public gym. Anti-burst balls on the other hand, while not indestructible, will slowly deflate if penetrated. A ball’s burst rating will help you determine how much it can handle. A rating of 1000 lb or more is ideal. 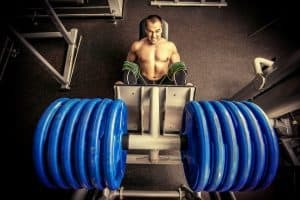 While you may not weigh half a ton, certain exercises will put a lot more force onto the ball than just your bodyweight. The accessories included in your purchase can also make or break a deal. Inflating a ball with your mouth will either take every last breath you can muster, or simply prove to be impossible. If your stability ball doesn’t include a pump, be sure to pick one up – especially if you plan on frequently inflating and deflating the ball. The first time you pump up your ball may be a little daunting. While there isn’t a specific air pressure to aim for, pumping too much or too little won’t be particularly constructive. A simple way to ensure that you’ve put the correct amount of air into your ball is to measure the circumference and keep pumping until it matches that of the size you purchased. If you don’t have a way to measure the circumference of your ball, then you can just go by feel. If when you sit on your ball, you feel like you’re sinking into it, then you haven’t inflated it enough. If your stability ball feels hard, and has very little ‘give’, then you’ve probably inflated it too much. Please note that these will be relative to your body weight. Lighter individuals will need to inflate their ball less than heavier individuals, as a general rule. Keep in mind that most balls will require some time to stretch out and “breathe” when unboxed before you can fully inflate it. In most cases, a couple of hours is all they need. What is the goal I’m trying to achieve in using the ball in this way? Am I truly prepared and able to use the ball in this way? If you’re unclear on either of these questions, then you risk injuring yourself. 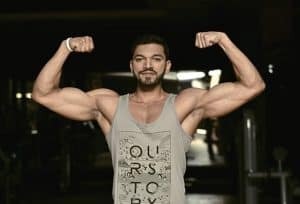 The fitness community, for example, is full of stories and video clips of people trying to perform exercises on a stability ball that they’re simply not yet capable of performing. The result is often painful, and sometimes hilarious. The point here is to be clear on what you want to use your stability ball for, and ensure that you are taking sufficient time to develop the required skill. Well, there you have it: 6 great stability balls that anyone can use for almost any purpose. It should be clear by now that adding a stability ball to your workout routine, office, or general life is a no-brainer. They’re adaptable enough for beginners to enjoy regardless of experience, yet versatile enough to challenge even the most seasoned athlete. They can even keep an expecting mother fit through a period where exercise is usually avoided, and help her in successfully delivering her little bundle of joy. Finally, let’s not forget just how impressive you’ll look when your co-workers walk past and stop to admire your monk-like discipline as you sit on your stability ball and type away.